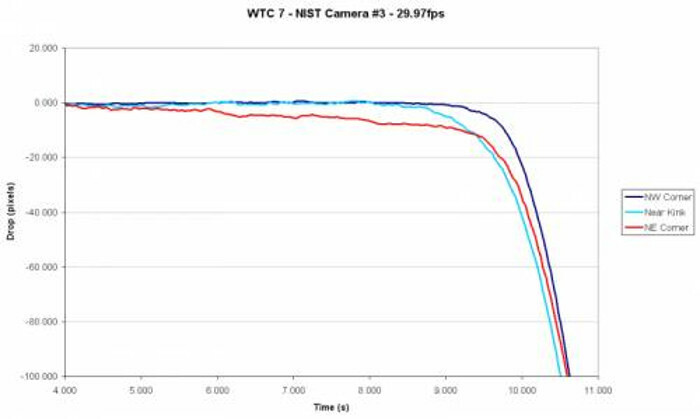 How Buckling Led to "Free Fall" acceleration for part of WTC7's Collapse. Discussion in '9/11' started by Mick West, Dec 22, 2016. The collapse of WTC7 is something that convinces people that 9/11 must have been some kind of complex inside job, with the building rigged with explosives set to go off after the planes hopefully hit somewhere and fires burned for hours. Assuming this is a plausible plan for the sake of discussion, what is it about the collapse of WTC7 that is so suspicious? Well it does (unlike WTC1 & WTC2) actually look like a a controlled demolition - the building falls more or less straight down into a cloud of dust, unlike WTC1/2 where the clouds of dust started near the top of the building. But perhaps the most compelling aspect for many people is the fact that it fell so fast, and that for a portion of the collapse the acceleration of the building was indistinguishable from freefall. NIST explains it like this. So there you are, negligible support from the structure below because the exterior columns buckled and lost their capacity to support the loads from the structure above. Here's the type of buckling I am talking about (although this is during stage 1). And look at that in perspective. The building is actually a lot taller than it appears in the video, and the above image only shows the bottom. See where the actually is relative to the top and it makes a lot more sense. The problem here is that it does not make sense to people. Even if the columns buckled, wouldn't they still provide some resistance? Well yes, but the key question here is how much resistance. If they provide a force equal to the mass they support times g, then the mass they support will not move. If they provide a force equal to 1% of the mass times g, then the mass will move down with an acceleration of 99% of g (i.e. negligible resistance, and essentially free fall). Columns of a building can support a static load of a low multiple of the mass above them before failing. Conservatively you can use 2x. So put very simply if the support of a column was to be reduced so that the mass it previously supported were to fall at 99% of g, then the supporting strength of the column would have to be reduced by a factor of 200. And this happens when a tall column or wall loses its support and buckles. Notice is does not mean zero support. If a column could support 1000 tons, and it's degraded by a factor of 200 then than means it can still support 5 tons. However while the column is buckling the 1000 tons it was supporting will fall at an acceleration of 99% of g.
I then took another can of the same type and, like with WTC7, I removed the structural support. I cut the top and bottom of the can and flattened the sheet of metal into a single wall. I then tested how much weight it supported. It was less than half a pound. The exact same piece of metal that previously supported 130 pounds was now supporting less than half a pound. Over 200x reduction in supporting strength. This means that if you put the amount of weight that it could previously support above this structurally unsound piece of metal, it would fall at over 99% the rate of acceleration of g.
And that's what happened with WTC7 during those 2.25 seconds of "free fall". The columns below had buckled, and offered negligible resistance. Still tons of resistance, but compared to the mass they previously supported, it was practically nothing. Hence 99% freefall. The above is largely concerned with the collapse of the exterior of the building. However it should be noted that all of the interior columns also failed by buckling before the exterior of the building buckled. The exterior columns are just starting to buckle at this point, but the interior columns have all failed. Nice demonstration, Mick! I am sure you are aware of the numerous limits of the model, and that of course a value such as "1% capacity" or "99% of g" would not be constant all the way down, but instantaneous values that change as the structure deforms further. 1. Here in Europe, soda/beer cans have become so rare, I hardly remember the last time I had one under my foot. Their tin walls seem to have grown much thinner since my youth. Back then, a Coke can would easily hold the full weight of a slanky 15-year old, and then some (like, allow him to wiggle a little - dynamic forces). I am sure you could have measured 200, 250 more pounds, carefully and statically applied, back then. The fun thing was to stand on a Coke can, then bow down carefully (I was never good at keeping balance, so that was a challenge to me! ), and then tap the side of the can ever so slightly with your fingertip. Result: Immediate collapse into the can's footprint at free-fall acceleration! In fact, no other method would flatten a can as thoroughly and compactly as this! Whoever has done this experiment should understand perfectly the transition from full capacity to almost no capacity in virtually an instant, just because vertical support in one location bows inward a tiny bit. 2. NIST's measurement of the collapse dynamics of the north wall, and the lengths and limits of their three stages, are inaccurate. The biggest difficulty is determining t0. An excessively detailed critique can be found here (do a local search for "The NIST data suffers from the following (non-exhaustive) series of technical issues" to get a concise list of problems). 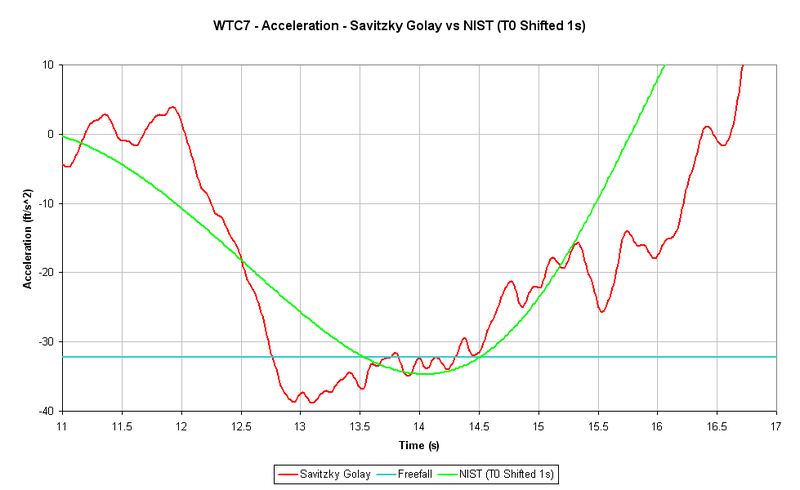 Femr2 has done video analysis that appears much better than NIST's - here is his acceleration plot - and found that Stage 1 (less than g) is only about 0.75 seconds (half of what NIST found), and that acceleration seems to have exceeded g even for another roughly 0.75 seconds! 3. The accleration profile of course depends on the - arbitrarily chosen - point on the structure that you measure. It seems that the NW corner, being about the last point on the roof line to release, would exhibit the most extreme acceleration, as it remained conected to the falling north and west faces pulling it down. 4. Elsewhere (e.g. Facebook - 1.5 years ago... At metabunk, too? Don't remember) there have been discussions of why and how >g could arise. I can think of three mechanisms off the top of my head: 1) Steady rotation; 2) elastic response of a vertically aligned assembly (focus on Elmer Fudd's hat, that lingers in the air momentarily as Elmer already falls down the Canyon; then Elmer's looong arm reaches up, grabs the hat and pulls it down as the arm snaps back to normal length). 3) An upward force on the core end of the floor beams (connecting core and perimeter) causes a downward force on the perimeter end. As a corrolary, when you measure a = g, it doesn't mean the object is actually in free fall. 5. NIST's complete collapse simulation/animation appears strange in that many columns are shown as still connected despite bowing very far from vertical alignment - they almost look like noodles. Is this realistic? I don't think anyone has tried to replicate this by a simulation of their own, and only remember non-expert judgements on this issue, so don't believe it just because I say I think there may be a problem. Are NIST's sim-columns too ductile? The length of stage one does not really affect the principle being demonstrated here. The important point is that buckled columns can be reduced in strength so much that they might as well not be there. And >g is really just a little puzzle, as it's hardly evidence for controlled demolition. If anything is of interest, it's the height differential: If and when the center of gravity (which cannot be seen or measured, of course), drops at = g (it certainly never actually does), all potential energy is converted to kinetic - no deformation can take place. While the CoG drops at x% < 100% of g, 1-x% of the PE differential is available for "destruction". Tony-Szamboti-like number-crunchers could, in principle, calculate the energy Edeform required to buckle all perimeter columns, and compare this with that proportion of PE differential in Stage 1. In theory: If (1-x%)*PEdiff < Edeform, then there is evidence for additional energy sources helping the destruction - hints of CD enter in. Here: Truthers claim that Edeform > (1-x%)*PEdiff(Stage 1); but they have never evaluated either side of the inequality. They never computed at least an upper bound value for the right and a lower bound for the left side. Being vaguely aware of this, they sometimes suggest the additional claim that the collapse went from 0 to g in no time, which would put the Stage 1 height differential at 0, while Edeform must be > 0. That would indeed make the inequality valid - but evidence is against that. They are vaguely aware of this, too! That's why, for example, AE911Truth uses vague/misleading language: "Sudden onset: The roofline of WTC 7 went from being stationary to being in free fall in approximately one-half second." This wording is designed to somehow suggest that the available PE differential is negligible - but to the keener reader betrays the fact they know it's definitely not zero. Who determined that "one-half second" is "sudden"? the transition from full capacity to almost no capacity in virtually an instant, just because vertical support in one location bows inward a tiny bit. This seems like the principal cornerstone of the entire 9/11 discussion. All the incredulity seems wasted by this simple point of fact (or concept). How to brace it though? I'd like to do a nice illustrative experiment that can be cheaply replicated. With this much bowing the bar supports just 12 pounds. How would I have to brace it so that it supports 1200 pounds? Theoretically I don't need to use multiple supports, I can just use an 8" section braced at either end and that should be the same as the longer piece braced every 8"? Theoretically, column capacity[*] is proportional to the inverse of unbraced length squared. If 48" has only 12 pounds capacity, 8" (1/6th the length) should have a capacity of 36 x 12 pounds = 432 pounds. If you brace[**] both ends of the 48" rod, and brace it at half its length, capacity should quadruple. It will bend in an S-shape then (equivalent to the second mode of buckling), with both halves having the same capacity of 48 pounds. [*] "Capacity" meaning the critical load, which is the maximum load which a column can bear while staying straight. That's not actually what you are doing - you measure capacity of an already bent column - right? [**] "Braced" meaning: Rotation free; translation fixed. With #3 if you view a column in isolation then the applied load remains the same, so the column continues to buckle as the resistance drops. But if you look at a single column as part of a larger system then you have to account for load redistribution. For example in WTC1/2 the planes cut columns, so they now carry zero load. That does not mean the load drops, because initially there was enough redundancy to spread the load to other columns. With a buckling column, the load could very well be redistributed to other columns, meaning the buckling could stop after a while. With WTC7 there's two major places where this applies. Column 79 - the failure of which did not redistribute the load, so the collapse rapidly progressed to the roofline, sinking the penthouse. Probably due to the long spans around C79. Then there's the outer wall after the interior collapse. Here there's limited opportunity for redistribution as you've just go columns to the left and right of you. Once one column buckled then that would immediately cause adjacent column to buckle until the entire wall was buckling. With WTC7 this buckling was precipitated at the lower floors due to the impact damage from falling debris - where the columns only had one adjacent column to transmit the load to. Simulations show that without that damage the walls would have initially folded more like large stiff sheets. The buckling is actually detectable in that frame across the entire building, but one second later it's reached a major failure state. All agreed so far. In addition, c79-81 all have no diagonal bracing, which I believe is a major reason why they could not redistribute a lot of vertical load among one another. I disagree with this to some degree, and think the opposite is true: The perimeter columns were more closely spaced and had those girder belts and strong moment frames - there was very efficient load redistribution between them, and I think this is why the perimeter withstood the core collapse for so long: Almost all exterior columns were taken to very close their capacity in rapid succession due to their sharing loads. When finally the first did buckle, the rest followed suit rapidly because they were already close to failing due to having aken on loads. Nicely observed - I never studied that late stage of the collapse in any detail. I was aware that including or excluding the impact damage made a significant difference, but never bothered to figure out details. Some useful perspective. People get used to seeing this video that looks like the building neatly drops with little deformation. But they perhaps do not realize they are seeing only 40% of the building, and the buckling damage sections are obscured. Not to mention that the columns below floor 8 were very different in number. Above floor 8 there were 57 columns on all 4 sides of the trapezoid perimeter. Below there were only 26. How come? ON the north side 8 columns were on the ends of cantilevers... the east employed braced frames / trusses with diagonals and only had 4 columns in axial alignment . The west had 5 axially aligned and the south all but 2 of the columns from above axially aligned. The concept was to use a "belt truss" of 2 stories in height to carry the column loads and redistribute them 57 down to 26... less than half. This is one of the most useful angles. We can clearly see significant buckling occurring here along the corner edge as the building descends at "free fall". It is interesting to see how the three cans seem to keep leveling themselves out. Rather than collapse to the side that where they failed, the load is distributed to the others and it sort of "wobbles" down evenly. Most people that can't swallow how all three buildings fell "straight down", instead of leaning to the failed side, can hopefully see how this could happen. Failure on one side "Can" drop the undamaged portion relatively straight down. The building could right itself as it is falling. There is a leg quite firmly attached to the foot, and a man quite firmly attached to the leg. These factors miiiight play a role. Perhaps the man is trying to stay level? That's my foot, and slow motion footage. I was not consciously trying to stay level - but I'd imagine my weight shifted quite a bit. Your muscles react - flex and relax as pressure from underneath changes. This is unconscious reaction, I doubt you could keep your muscles from reacting if you wanted. The point is that NT ascribes the leveling to some passive reaction of the cans and fails to consider the big, active man. The load changes significantly during the crush. You think? Hmm. I think the video nicely demonstrates what you want to demonstrate. It merely doesn't validly demonstrate what NT thinks is happening. I don't think that using a big weight would demonstrate anything of use wrt to the WTC collapse. It would illustrate weigh redistributing with a static weight, and it would be fun. ... it would be fun. And >g is really just a little puzzle, as it's hardly evidence for controlled demolition. It's most likely caused by parts of the building that started falling several seconds earlier (such as the penthouse, upper floors, or possibly the south façade) impacting on lower parts of the building after a long drop, transferring their momentum and kinetic energy of several stories drop onto the rest of the building on impact, thereby "pulling" the rest of the building down faster than free fall. Nothing against NIST, but I doubt that it's actually possible to model the collapse as closely as the animation makes it appear. There are so many unknowns not only in the starting conditions (exact temperatures and distributions of fires, steel corrosion, deformation due to impact damage and resulting loss in stability, resulting load redistribution) but also in the seconds after collapse onset of the penthouse (impact damage, impact location, temporal order of failures). The real priority for NIST was to identify possible collapse scenarios, not to replicate the exact progression as it happened. They probably picked one for eye candy out of the hundreds they calculated, amid millions of possible progressions. Apart from that, I would imagine that 8 floors of free fall is something you'd want to avoid in a controlled demolition, because it can 1: leave 8 story tall wall segments to potentially topple or buckle sideways, making the debris radius larger and 2: create stronger seismic signals when it hits the ground. David Chandler also said he wasn't able to prove free fall in any videos of actual controlled demolitions with his method, which he of course blamed on the 911 conspiritors using "overkill" to destroy the evidence of their insidious plan completely. If I remember correctly they showed controlled demolitions next to wtc7, but the other buildings were all smaller and closer to the camera , which means they dropped slower if they moved the same way on the screen (I'll try to find the videos later). First time commenter on this post. Civil Engineer chiming in (Penn State, class of '94) Rolling up my sleeves here.. I am reading your statement above. "Apart from that, I would imagine that 8 floors of free fall is something you'd want to avoid in a controlled demolition, because it can 1: leave 8 story tall wall segments to potentially topple or buckle sideways, making the debris radius larger and 2: create stronger seismic signals when it hits the ground." " It's most likely caused by parts of the building that started falling several seconds earlier (such as the penthouse, upper floors, or possibly the south façade) impacting on lower parts of the building after a long drop, transferring their momentum and kinetic energy of several stories drop onto the rest of the building on impact, thereby "pulling" the rest of the building down faster than free fall." There are huge flaws in this statement. You are basically treating most of the structural steel in the building, before the collapse, as non-existent. This non-existence is the only explanation for your theory. The penthouse fell and transferred its momentum and kinetic energy to the lower parts of the building after a long fall... a long fall through what?? THIN AIR according to your deduction. There is a very basic law of physics that is being violated by the collapse of this building: the conservation of momentum. You can drop two bowling balls from a ladder over two different things and get two different results: The first ball falls straight through thin air and achieves free fall equal roughly to the acceleration of gravity. The second ball falls through glass panes or cardboard, or some other "weak" material spaced several inches apart, lets say with tiny dowels, or some other material, and it will NOT achieve free fall. Why? Because it cannot fall and destroy the glass/cardboard/paper mache'.. whatever you put below it, and achieve free-fall speed identical to the ball that fell through nothing. The ball will be converting its momentum into energy needed to destroy the material below it. Even if it is tissue paper that it is fall through, if you get an accurate enough measurement, you will detect a different acceleration based on this fundamental law that CANNOT be violated. How does the ball fall through the material below it and very closely achieve the acceleration of free fall? In the third scenario, you place explosives on the glass panes, cardboard, whatever, and time the explosives to go off as, or just before the ball is falling through the material. In this scenario, the ball is able to achieve free fall because its momentum and kinetic energy is conserved because the explosives are doing the work of destroying the glass/cardboard/paper mache' etc. But what we are discussing here is the buckling of the outer walls leading to near-freefall. How much resistance will the walls offer once they are buckled? If it's much less than 5% of the static load then you'll essentially get free-fall withing the bounds of measurement from videos. No, because the buckling is in the lower floors, hidden by buildings. First time commenter on this post. Let's see here... so your argument is based partly on this observation of a "flaw" in the otherwise almost picture-perfect free-fall collapse, through the path of greatest resistance, of a 47 story skyscraper and siting that as a reason for why it was NOT a CD. More about that in a moment..
No, you got this the wrong way around. By observing that free-fall is undesirable and unusual in CDs, Hierophant is not arguing "this is evidence for NOT CD", instead he is arguing against "this is evidence for CD". Notice the difference? He is denying the claim he is responding to, which is the "Truther" claim that free-fall is evidence for CD. He say: No it is not, because free-fall does not actually occur in real CDs, and would be undesirable anyway. "It's most likely caused by parts of the building that started falling several seconds earlier (such as the penthouse, upper floors, or possibly the south façade) impacting on lower parts of the building after a long drop, transferring their momentum and kinetic energy of several stories drop onto the rest of the building on impact, thereby "pulling" the rest of the building down faster than free fall." You seem unaware of what the "it" in Hierophant's "It's most likely caused ..." refers to: Not the collapse as such, not the mere near-free fall, but that (a part of?) the north wall even descended at MORE than g! Are you aware that this (probably) happened? CD (specifically: the sudden severing of columns) would not explain this. Hierophant mentions what can a brief period of >g on a part of the building, and that is independent of the mechanism of collapse initiation. There is a very basic law of physics that is being violated by the collapse of this building: the conservation of momentum. You can drop two bowling balls from a ladder over two different things and get two different results: The first ball falls straight through thin air and achieves free fall equal roughly to the acceleration of gravity. The second ball falls through glass panes or cardboard, or some other "weak" material spaced several inches apart, lets say with tiny dowels, or some other material, and it will NOT achieve free fall. Why? Because it cannot fall and destroy the glass/cardboard/paper mache'.. whatever you put below it, and achieve free-fall speed identical to the ball that fell through nothing. Destruction (deformation) of material does not necessarily change momentum of the impacting assembly, and certainly needs not change the velocity of its upper edge. You need to look at conversation of momentum and of energy in conjunction. You need to keep track of all the mass that you cannot observe - the entire system. And you need to be mindful of rotations. What Hierophant explains is that there is angular momentum and rotational energy in the system because the core drops before the perimeter does. The ball will be converting its momentum into energy needed to destroy the material below it. I have not studied civil engineering at Penn State, but I imagine that their course work would contain enough physics to prevent such nonsense from being written. Momentum cannot be turned into energy. Energy can be turned from one form into another - kinetic energy into deformation, for example. Even if it is tissue paper that it is fall through, if you get an accurate enough measurement, you will detect a different acceleration based on this fundamental law that CANNOT be violated. Since you cited a nonsense mechanism that doesn't exist, your argument is moot. Even if you corrected your nonsense statement for something real, you'd still not consider mass and energies not visible to the cameras - the motion of the core and the floors. How does the ball fall through the material below it and very closely achieve the acceleration of free fall? Then it achieves free fall. First: The roofline of WTC7s north wall did not go from 0 to in absolutely no time and space. Instead, it started dropping at less than g for roughly a second (NIST says 1.5 seconds - that's most likely too long. Some guy posting elsewhere as femr2 has probably done the most accurate video analysis and found ~0.75 seconds), and fell a few (I don't recall values - more than 2, less than 10) feet during that time interval. Some of the potential energy loss during that phase went into buckling columns, possibly near the 8th floor (some more energy may have been provided by the alreadey falling mass of the interior of the building, e.g. collapsing floors tugging or pushing on the perimeter columns). Then: Once the columns' capacity drops to <5% of load, descent is indistinguishable from free fall. They dropped at an average of about g through the height of about 8 floors - this would indicate that the buckling severed the perimeter columns on or about the 8th floor. The lower ends of the falling upper 39 stories of the north wall are not going to touch anything that can provide significant resistance: If they pass outside the lower 8 stories of perimeter, they fall through thin air indeed. If the pass inside the lower wall, they may hit floor slabs or girders, but the vertical capacity of those to bear a punctual load like a column is a magnitude or two less than that of intact columns - i.e. negligible. In the third scenario, you place explosives on the glass panes, cardboard, whatever, and time the explosives to go off as, or just before the ball is falling through the material. In this scenario, the ball is able to achieve free fall because its momentum and kinetic energy is conserved because the explosives are doing the work of destroying the glass/cardboard/paper mache' etc. Cool story, except there is zero evidence for explosives going off and cutting those very massive columns. You know, I hope, that explosive CD is done with hígh explosives - the key property being that they create shockwaves - waves faster than the speed of sound in the medium (steel in this case). It is the shockwave that cuts the steel. The shockwave is a special kind of acoustic wave. In short: It is the very SOUND of the explosion that cuts the steel. You argue that ALL perimeter were cut with explosives, right? In order for that to happen, the shockwaves need to be of some minimum amplitude - that's loudness. You can assess the necessary loudness of such charges by watching any video of any actual CD. Please take an hour of your time, spend it on YouTube, searching for unedited videos of actual explosive CDs. Count how many videos you find where the explosions cannot be heard at all. Then spend another hour and locate all unedited videos of any and all WTC collapses. Repeat the counting for cases 1-4. If you are honest to yourself after this excercise, you will and must concede that there were no explosions consistent in loudness, timing, number and brisance with explosive CD at the WTC. My theory works with or without structural steel still intact underneath the penthouse. Because many floors collapsed internally due to the fire before the penthouse fell, and because the collumns which held the penthouse buckled because of the missing floors, there actually was a long unobstructed drop over several floors underneath the penthouse. But that's not necessary for my theory to work. The reason for that is because yes, it fell through THIN AIR, whether there was still structural steel underneath it or not, because there is a lot of thin air there either way, and it will still accelerate downwards as it falls through thin air. When it hits a floor it will slow down, but it will accelerate again in the thin air underneath the floor, unless the floor stops it without breaking. That can result in a net acceleration from top to bottom even if the underlying floors were still there. There is a very basic law of physics that is being violated by the collapse of this building: the conservation of momentum. You can drop two bowling balls from a ladder over two different things and get two different results: The first ball falls straight through thin air and achieves free fall equal roughly to the acceleration of gravity. Although we weren't talking about free fall but about an acceleration higher than free fall, a bowling ball analogy may be useful here. Imagine you drop a bowling ball from 10 meters height into a bag sitting on a glass table. The bag is going to accelerate downwards faster than free fall when the bowling ball hits. The glass table is the lower part of WTC7, the bowling ball thepenthouse/innards of the upper part, and the north façade the bag. Another example of faster-than-freefall acceleration from gravity would be a heavy bowling ball resting on the middle of a horizotnal long (light) wooden board, and the board is resting on two chairs at its ends. Remove one chair, and that side of the board will accelerate downwards faster than free fall, because it's being pushed down by the combination of the bowling ball and the other chair creating a lever and rotation. If you watch he wtc7 collapse closely from the north, you'll see that it first tilts/turns counter-clockwise as the penthouse falls, but start to turn clockwise during the "free fall" phase. That's an indication that it's not actually free fall of an object that can be approximated by a point mass, but a movement of a deforming turning body subjected to outside forces which shows accelerations comparable to free fall in some parts. First time commenter on this post. Civil Engineer chiming in (Penn State, class of '94) Rolling up my sleeves here.. If that is true, you should do better using what you (should have?) learned to find possible explanations for what you observe, instead of repeating simplified Richard-Gage level "physics" which cant explain what you see because they only mention less than half of the story. Also, I wonder if I should draw some pictures because its not so easy to convey things using only ascii. True...Hadn't thought of that in my mental equation. Mick could then attest to his shifting. I guess a better test would be to do the same with a fixed weight on top and see what happens. As far as I know the penthouses began to fall prior to the collapse of the north facade. And even in case of free fall of the last penthouses themselves they would not have hit the ground before the free fall phase of the facade ended. When falling debris from the roof knocks off floors from the fasteners to the facade, doesn't that mean that vertical forces act on the facade? Forces that may have accelerated the facade downwards for about two seconds? BTW: Did you already consider yet another hypothesis: "Coupled reaction between core and perimeter"
So how is it possible for the perimeter to drop faster than free fall? The core drops first, followed by the east corner and then the west corner. Of course, the center of mass of the entire system cannot exceed gravitational acceleration, but the perimeter can. Core and perimeter were still connected through the floor system. Once the core dropped at gravitational acceleration the core-floor-perimeter could have acted like a spring system. First, the core pulled the perimeter inwards. Secondly, the perimeter failed at a very low elevation and was then pulled downwards by the "floor-springs". The falling core slows down at that same time until the entire system fell as one unit. deirdre told me that my "post might be removed in the future as" he "can't tell if" my "comment has to do with buckling". Well, I just think that buckling can explain the collapse; it cannot explain free fall. In my opinion the flaw of the analogy to the soda can is the immediate and total loss of vertical load carrying capacity. This did not happen to the exterior columns. They had been severely damaged at lower floors. Above this area they still had lateral support. When the north facade collapsed, the support structure was overloaded, but to destroy it part after part some energy was needed. To me the assumption that this energy was neglegible compared to the kinetic energy for two seconds seems to be - unnecessary speculation. It's not necessary because the core of the building began to collapse long before the north facade. And the collapse of the core finished many, many seconds after the end of the free fall phase. However, there were many connections between the core and the north facade which had to be cut, and of course there was friction. Are there any doubts that vertical forces have been transfered from the core to the north facade? So why speculate about soda cans? Nor does it happen to the soda can. The can illustrates how a structure can remain upright and in shape while local damage is inflicted, up to a point where locally an overload situation occurs, and that very quickly then progresses to a point where very little structural capacity is left. This is not in opposition to the factors you mention now - both perhaps, probably, occurred and played a role simultaneously. You are correct to point out that energy from the core may have / probably has added to the deformation of the north face. So why speculate about soda cans? The soda can example demonstrates that the load bearing capacity of a structure can be reduced from 100% to <0.5% in a short period of time. It's just illustrating a general principle. The outer walls clearly lost a lot of support, and the most obvious way they would do this is via buckling. Here is a high quality video of a large metal (likely steel) transmission tower collapsing due to fire. Though the tower didn't completely fail like a large building (likely due to a much higher strength-to-weight ratio throughout and wires holding it to other structures), the portion that did fail appears to have failed via buckling--at first in one corner and then very quickly in all corners at once. The significant "thing' about the slightly below, actual or even slightly above free fall is the duration of this motion. It is well established the it was something close to 2.2 seconds. The means the movement downward traveled about 104 feet. The significance of this distance is that it represent 8 story heights. The downward motion was 8 story hts at FF+/-. There is not visible destruction of 8 stories in any camera angle because of camera views being obstructed by shorter buildings. We can infer that the "missing" resistance of 8 story heights was hidden by the low buildings and was somewhere between the ground and the lowest floor in the camera's view. In examining the structural design of 7wtc... a glaring element of that design is hard to miss. The lowest 7 floors were built over the Con Ed and required massive transfer structures from floors 5-7. Conceptually we can think of this as a bridge deck 7 stories above the water. It the supports for the span fail the bridge's deck will dropped at FF until it hits the water. If the bridge spanned over land... it would be the same. Now suppose there was a building erected on the bridge's span. When the span collapse it falls at FF until it hits the ground's resistance and the building built on the span then crushes up from its bottom because the momentum overcame the strength of the columns of the building. This WAS like Gage dropping a building from 8 stories up and of course it was self destruct as it crashes on to the ground. It was precisely the nature of the design which led to the 7 story close to FF descent. Whatever it took to destroy the axial load paths from ground to floor was the proximate cause of the collapse. The diagram posted above shows how few columns supported the facade on the first 7 floors. 57 above and 27 below. The 104' FF descent is not mysterious or odd if one looks at the structure. Whatever it took to destroy the axial load paths from ground to floor was the proximate cause of the collapse. I think this needs some clarification, because it sounds to the casual reader like you are saying "whatever destroyed the columns caused the collapse"
Based on the context of the thread I read it as "the columns buckled, which was immediately followed by collapse", but I suspect you meant it in a more abstract way. Capacity was destroyed... could be buckling., or misalignment or weakening from heat or a combination even being blown apart... but the evidence for being blown apart is not there.